Did anyone else hear that we are supposed to get more snow?! I love snow, but I think we need a little more time to get things cleared up after Nemo before we get any more. Anyway, I wanted to share a quickie workout with you that you can really do anywhere (I have done it in a hotel room, in our kitchen, in my bedroom). I am all about creating workouts that do not require the gym or even any equipment because I think people use those as excuses far too often. You don’t need to workout at the gym in order for it to be a good workout! AMRAP= As Many Rounds As Possible. Perform the number of reps listed for each exercise and see how many full rounds you can do in 20 minutes. 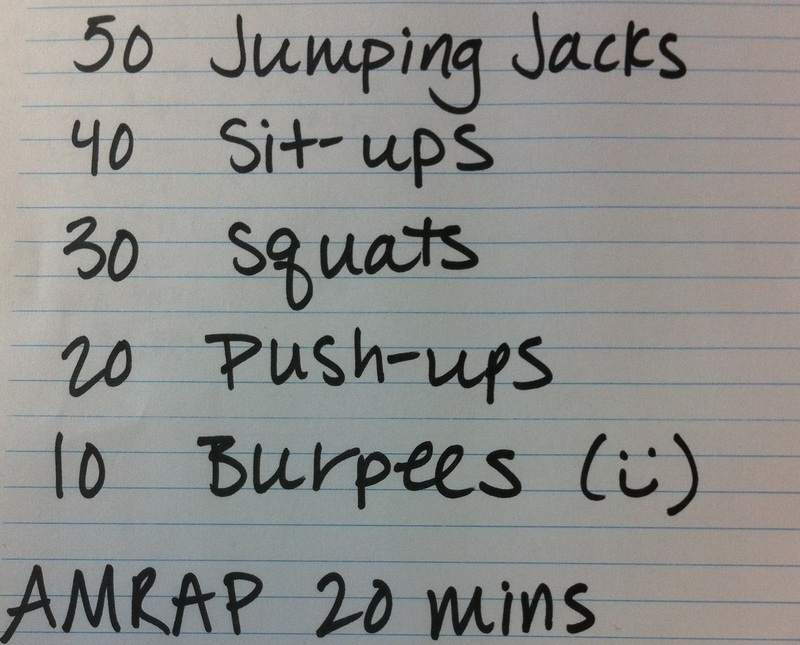 This may look easy, but it’s the 10 burpees to 50 jumping jacks that is really killer! If you have weights, feel free to hold them for the squats and the sit-ups- definitely adds some intensity! Jumping Jacks- if you do not want to jump, you can step your feet out instead of jumping them out. If they are too easy, try crossing your feet in the middle. Push-ups- you can do these on your knees or against a wall if you are not ready to do them on your feet and hands yet. If regular push-ups are too easy, try lifting one leg or doing tricep push-ups or spiderman push-ups. Burpees- you can walk your feet back into a high plank instead of jumping them back. It’s your workout so modify up or down as you see fit! Remember to keep good form throughout the workout! I know the goal is to work fast to get through lots of rounds in the 20 minutes, but if you are compromising your form because you’re speeding through the moves, you’re not getting the full effects of the workout and risk an injury. Questions for you! What is your favorite “at-home” workout? Do you like working out during your lunch break? Chicken Parmesan… with a healthy twist! What do you do when….